“We’re doing a century this year.” At least that was the plan for this year’s NMSS Tour du Jour with Stanford C-Ya. Last year we did the 70-mile option, but the ride seemed so relaxed and easy that this year we thought, 100 miles, no problem. So there I was the night before with my cycling buddies Debby and Dave at Debby’s newly purchased home. 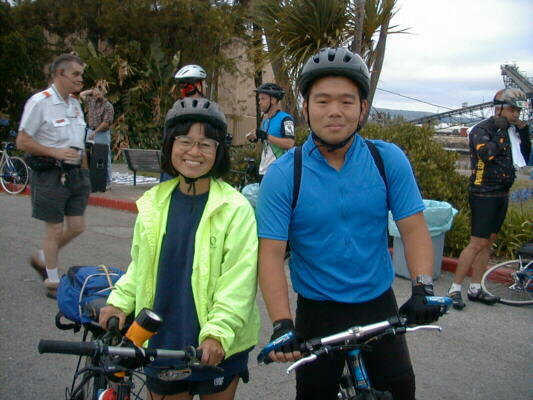 We had just seen “Buena Vista Social Club,” which would provide me with some highly needed sleep before the ride, and Debby cooked us pasta while Dave worked on her bike. Then Debby let me sleep in one of her rooms for the night. This allowed me to avoid having to drive so far to the Port of Redwood City—the start of the ride—and provided Debby with a second “alarm clock” as she woke up about on hour late last year. 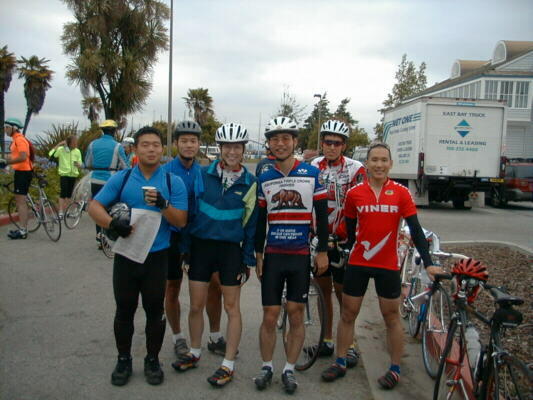 We all agreed to meet at the Port of Redwood City at 6:30 a.m., but only Adam and his friend Randy (who was only visiting, not riding) are there. But soon comes Dave, Dan, Phil, and Stacey. 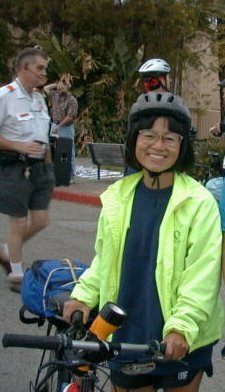 Alas, Radisha opted to come later as she was doing the 30 mile route, but we would hear later that she had a terrific ride. Phil and Stacey had planned on doing the 65 mile route on their mountain bikes, but the rest of us intended to do the 100. We realize that there would be tremendous overlap between the two routes, however, but after a brief discussion, we take off in two separate groups. Debby, Dave, Dan, Adam, and I take off at about 7:30 a.m. or so. The morning is cool and overcast, and Debby remarks just how much she preferred this weather. “I’m so glad it’s not going to be hot like last year,” she enthusiastically says. She is definitely in a good mood. She had warned me a couple of times before that she tends to be grouchy in the morning, but I have yet to witness this. Like last year, Adam and I frequently allude to the Tour de France, which Lance Armstrong is dominating this year. Otherwise, the first leg of this ride is quite unremarkable. Just a nice “stroll” through the west Peninsula with my cycling buds. Cool, I think, always liking a good chase, and thinking back to the Davis Double earlier this year where I had to chase down Dan. So after I indicate to the others that I’d like to do a fast “time trial,” off we go, with me at the front gradually increasing the pace. Whoops, I guess not gradually enough as after a couple of minutes, all of the others are a couple of hundred of feet back. I was quite surprised as Dan had showed in the Davis Double that he can usually hang onto any pace I go, and I knew from previous rides that both Dave and Adam are strong. So I slow just a tad, hoping they would join me and we could do some sort of rotating paceline. And in a few moments I do have some company. Adam had decided to bridge the gap. Dan, however, decided to conserve energy for his upcoming triathlon next week, and Dave’s knee apparently was bothering him. So only Adam and I ride together. And what a pace we go. Riding at at time-trial speeds upward of 26 mph, we are passing everybody down Foothill Road. We even are maintaing speeds of 20 mph past the 280/Foothill junction where the road starts to go uphill. Finally, here’s Debby up the road, near the Stevens Creek Reservoir. Hooray. The lead group now is up to three people. Anyhow, we get to the rest stop in Cupertino, which was in a different place than from last year. Here we even met Cornelia, a teammate of Dave and me in the 1998 Bay Area Hillclimb Series (and also the women’s champion). It is good to see her, and we would see her often during the rest of the entire ride. After the rest stop we head through Cupertino again, back onto Foothill, and get to the rest stop we had just stopped at 1.5 hours before. Once again, Debby decides to take off early again, and this time Dan joins her. Unbeknownst to all of us at the time, they head off the wrong way, and soon afterwards, the Adam and I head up this incorrect direction too. Kind of ironic for me considering that I did the ride last year and was even a “route sweeper” for the National Multiple Sclerosis Society this year. Instead of heading south on Foothill (again) and onto Moody, we all head north, as apparently many, many other riders do. Adam and I soon realize we did make a wrong turn but decide it’s not worth turning back—we’d just head to the next rest stop in Portola Valley, whose location we already know since we did the ride last year. This cuts off about three miles from the ride, and we get there quite quickly. We wait for about 45 minutes to see whether Dan and Debby would show. Finally, I speculate that since they started out doing this leg of the ride the wrong way, there were no signs to direct them to this rest stop and they probably went directly to Whiskey Hill, bypassing the entire Portola Loop altogether. Hence we take off without ever seeing them again. During this leg of the ride we are no longer doing any time trials, as Dave’s knee are still bothering him. Cornelia, ever the speedwoman, hence takes off on her own. The route traverses through Woodside and all the way down Cañada. During the cruise down Cañada, we pass by Jefferson road, which is where the 62-mile route diverges from the 100-mile route. After discussion we all decide to continue on with the 100-mile route, despite Dave’s qualms about being able to finish it. How much hillier can the ride get, we think? That question is answered within the next half-hour or so: plenty hilly. Though no climb would compare to Old La Honda, Skyline (north of Highway 92) turns out to be an unexpected surprise, esp. at after 6 or so hours of riding. Near Hillsborough, Skyline proves to be the longest climb of the day. It seems like everyone was bogging down on this road. The reward of all of this is a rest stop near the end of it. Feeling rather hungry I come on in before the others, and find Cornelia waiting there. Adam comes in shortly after, but poor Dave. His knees arere already having trouble and this climb must have been killing them. Indeed, he comes in more than 10 minutes later. “I think I’m going to SAG on in,” Dave says when he arrives. I figure, Dave must be really hurting if he was going to SAG in, as he’s a really tough guy. So the decision is made and we hung around for about an hour until a SAG vehicle finally came on through. 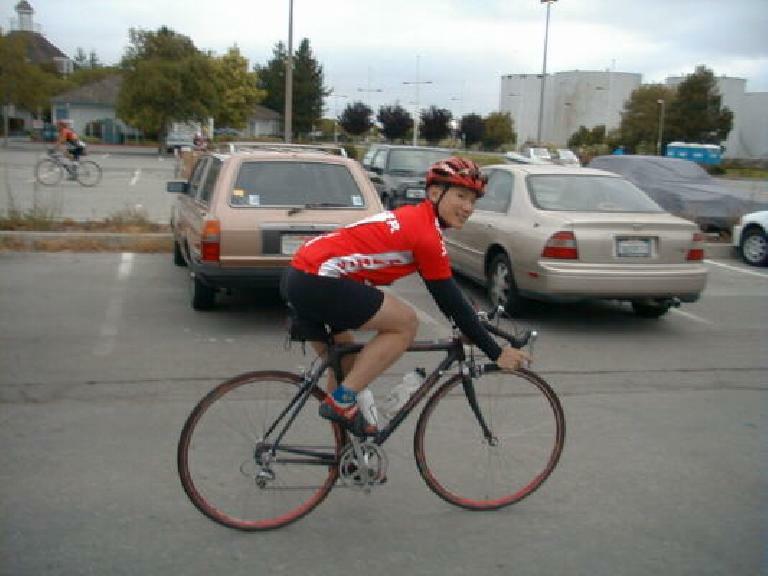 Despite abandoning, Dave accomplished a lot… his longest one-day ride ever, at 70 miles. Just 30 miles short of his next century. Well, another day. While waiting around Adam and I pick up Cornelia’s bike. Although her Trek OCLV carbon frame is one of the lightest in the world, she has a seatpost-mounted rack and bag mounted on it, and it weighs a ton. We could not believe it. It must weigh at least 35 pounds or so. “She’s HELLA strong,” Adam exclaims. Quite amazing, indeed. Cornelia takes off on her own, and not too long after, it’s just Adam and I. Adam is still looking strong, which is noteworthy considering that the distance we rode so far (70 miles) was his longest one-day total thus far, like Dave. The route uncreatively dips down into Hillsborough and retraces back onto Skyline, and again, as in many parts of the ride, there were numerous stop signs. Hillsborough is a pretty, if not yuppyish (read: expensive) area, and a delight to go through. My first time through here in a year or so. Midway through Hillsborough my cell phone rings… it’s Debby. She’s already home. “Dan and I got off course and then decided to do just the 62-mile route,” she informs me. I had speculated earlier this was the case. “I had lots of fun and was feeling good, perhaps strong enough to do the whole 100, but I wouldn’t have had such a good time.” She also mentioned how much better she felt this year than last year. Way to go, Debby. Adam and I continue on, and going up Ralston we are greeted by another Cannondale rider, who asks us what ride we are doing. Then, he motors off, with Adam and I unwilling (or maybe unable) to even try to keep up. It is apparent that we have slowed down quite a bit during the ride, but then again, it also underscores how much hillier the ride got since Mile 55 or so. The route retraces over Cañada again, and then up Jefferson. Totally uncreative, but somewhat nostalgic for Adam and me, having “Pantani’d” up this hill on the same ride just one year ago. Both of us are weary enough that no one evens suggests “Pantani’ing” it (or “Lancing” it, in honor of Lance Armstrong, who would win the Tour de France the next day), but again, it really doesn’t seem steep at all. It is really nothing compared to Skyline or several of the short hills through Hillsborough. And just past the top is the last rest stop of the day. We instantly see a familiar face there—it’s Cornelia, ready to take off again. And then, three minutes later, another familiar face, although one totally unexpected. It’s Phil, who we hadn’t seen since 8:00 this morning, and who was riding the 62-mile route with Stacey. Or at least, was riding with Stacey. “We got separated about 10 miles ago and I haven’t seen her since,” Phil says. “I waited around but I think she made a wrong turn.” So we invite Phil to ride with us to the finish, which is just seven miles away. The last 7 miles went through Redwood City, and traced over exactly what the metric route went through. Lots of stop signs and traffic lights again. Groan. And soon enough, the Port of Redwood City is in sight. At this time I am congratulating Adam and Phil. This is a particularly special moment for Adam as, surprisingly (considering what a strong rider he is), this was his first century. Phil isn’t even tired at all. And me… it is so nice to be back on the bike again, doing my first substantial ride since the Terrible Two Double Century and feeling like my normal, healthy cycling self for the first time since early June, when I started getting one illness or another. A reminder of why I love riding. 7:30 a.m. start, 5:00 p.m. finish—9:30 hours.